Tarantulas seldom exhibit obvious signs of illness -- they tend to suffer stoically until they ultimately succumb to parasites or illness. Accordingly, tarantula owners must be very observant for slight changes in their pets' behavior and physical condition to catch the first signs of illness. In all cases, consult your veterinarian if you suspect your tarantula is sick, and provide proper environmental conditions to ensure the creature's best chance of recovery. Dehydration is a common problem among captive tarantulas. Dehydration causes a tarantula’s abdomen to shrivel or shrink and may give your spider a “hunched” appearance. Treat this by temporarily moving your tarantula to a small, simple container with a very damp paper substrate and something under which she can hide, such as a piece of cork bark or a small cardboard box. It may take several days, but many tarantulas rehydrate after spending a few days in such a container. If your tarantula is easy to handle, grasp her gently around her cephalothorax, and turn her upside down. Using an eyedropper, drip water on her mouth opening. This often elicits drinking behavior. Parasites spell special trouble for tarantulas, as many of the medications and chemicals designed to kill parasites kill tarantulas, too. You may see tiny bugs -- technically they are other arachnids called mites -- moving around on your tarantula, or you may find them in the water dish. Your veterinarian can treat some mite problems by anesthetizing your tarantula and removing the mites manually, but they are hard to eradicate completely. Internal parasites are especially problematic, as they are incurable and often go unnoticed. One sure sign that your spider has internal parasites is witnessing wasp or fly larvae break through your pet’s abdomen. Unfortunately, this is always fatal for the tarantula. Most tarantulas are ambush hunters who go extended periods between meals. Entomologists do not know exactly how long tarantulas can go without food, but most can survive more than a month. Anecdotal reports of tarantulas surviving more than a year without food abound. Therefore, while you need not panic if your tarantula refuses a meal or two, fasts of more than a few weeks signal potential trouble. Such inappetence can be caused by septicemia, internal parasites or exposure to toxins. Additionally, poor husbandry can cause tarantulas to refuse food. Most tarantulas stop feeding prior to molting, but this is no cause for concern. One of the most impressive traits of tarantulas is their ability to control eight legs and two pedipalps with great precision. If your tarantula does not exhibit controlled movements or is not capable of crawling around her cage effectively, she may be ill. Many different ailments, including exposure to toxins, septicemia, dietary deficiencies and old age, can prevent your pet from moving properly. Such symptoms indicate that veterinary care is necessary. Gently scoop your tarantula up by placing your fingers under her body and place her in a paper-lined plastic container for transport. Tarantulas have a layer of fine hairs that covering their bodies. 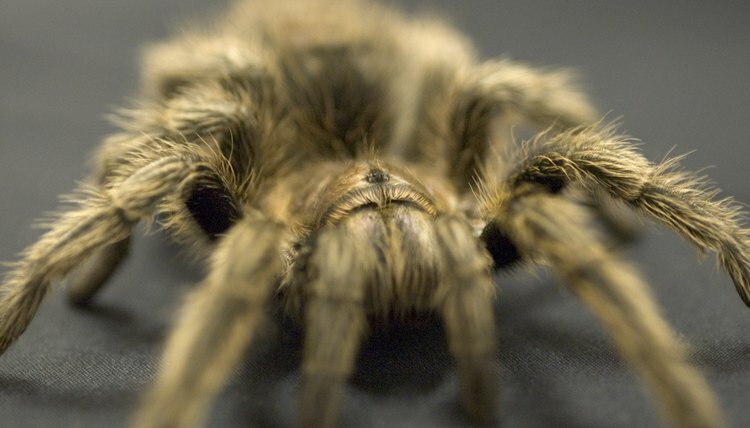 Most North American and South American tarantulas possess specialized hairs that serve a defensive purpose: When threatened, these tarantulas will flick the hairs from their abdomens into the air; if they contact the skin or mucous membranes of a person or animal, they cause itching and irritation. When this happens, a bald spot may form on the tarantula’s abdomen. Caused this way, a bald spot is not a serious concern; the hair will grow back with subsequent molts. However, the “Exotic Companion Medicine Handbook for Veterinarians” says bald patches can indicate bacterial infections and occur in geriatric tarantulas, so it is wise to consult your veterinarian to determine the cause of the bald spot.